1. I hope you all enjoyed a meaningful Christmas this year. Ours was wonderfully relaxing catching up with family we don't get to see very often. 2. We spent the afternoon hanging out with a great photographer and friend of ours here in Lancaster named Jeremy Hess. He's doing some cool things with his photography and has some great industry ideas that would be fun to be a part of. 5. My Dallas Cowboys clinched a playoff spot yesterday with a 17-0 win over the Redskins! This sets up a great game next week against the Eagles. Good morning everyone! Merry Christmas, and I hope that at least once today, we all stop and thank God for the miracle of salvation and the gift that He sent to the world in his Son, Jesus. Because if this story is true, it changes everything. First of all, thank you to each of you who submitted images to the contest. I was blown away by the amount of entries, and even more by the amount of people who voted! It was cool to read the story behind some of the photos, and how something as relatively insignificant as a plastic tree can have so many emotions and memories attached to it. I had a blast with this contest, and I checked Facebook several times every day to see new entries and new votes... it was so fun! Molly Jamieson with 96 votes! And, because this little heartbreaker reaching for the tree was a close second place with 83 votes, Ashadee Miller wins a free Children's Session! I'll be leaving the contest images on our Facebook page for a few more weeks, but then they will all be erased to prepare for our Valentine's Day Contest! Keep checking our blog here for more info on future contests and info. Also, head on over to www.GehmanPhotography.com to look at some of our wedding photography, and for information about commissioning us to work for you. Thanks again! See you on Monday! 1. We had Jodi's Family Christmas this past weekend, and 16 kids under the age of 14 makes for a busy house! So, we skipped that, and rented the gym at Jackson's school. There was lots of room for the kids to play, and we got to play more active family games, like dodgeball, basketball, and volleyball. Great food, great family and celebrating the story of a God who gave his life for us = a Merry Christmas! 1. Susan Boyle "I dreamed a Dream" with 82,174,629 views. 3. Over 2.1 million couples were wedded in the U.S. in 2008, with the average wedding costing $28,704, and the average age being: Bride, 27... Groom, 29. 4. Gotta mention my Dallas Cowboys knocking the New Orleans Saints out of their undefeated season! The 'Boys won 24-17 on Saturday night, increasing their chances of making the playoffs and making the Saints 13-1. Now we need the Redskins to beat the Giants tonight, and the Cowboys to win the last two games. 5. Our family will be traveling this week, so we're praying for safe travels for us and for all of you. There's a lot of snow in the forecast, and that always makes things interesting. 6. Photo of the Day: It was snowing today, so I grabbed a can of Coke, plopped it in a snowbank and made a photo. Jackson is our 5yr old, and this week was his first school Christmas program. So, as he was getting ready for the big night, I decided to work with him and do a little photo shoot of the process! This type of video is in the Motion product line that we're starting to move towards in 2010, where we combine cinema with photography. Motion capture goes beyond photography to capture the giggles, and moving expressions that still images just don't quite capture, and it's an awesome way to preserve those little moments in life. Give us a call if you're interested. Have a great weekend everyone! Keep those entries coming for our Facebook Christmas Tree Contest, and voting for your favorites. There's some close races as a few images are picking up speed. They'll need your votes! Click here for more details. 1. The most effective places to apply perfume or cologne are on the middle of your chest or behind your knees. 2. My new favorite website is Lala.com! It's like iTunes, except that you can listen to entire songs/albums instead of 30 second previews. You can also create a queue which can be set to "shuffle" and has no limit that I know of. (My queue is currently 600+ songs.) You get to listen to full songs one time for free, but you can also purchase a "web version" of the song for 10 cents for unlimited listens. You can also upload your personal music collection, that way all your music is on the Lala website so you can access it from anywhere you have the internet. I'm having a blast listening to old music from high school and random bands that I would never want to own. 3. I know I mentioned this in our contest announcement post, but here it is again! Become a fan of Gehman Photography on Facebook! You can follow the blog feed on there, tag yourself in pictures, and participate in special contests and news only available to our Facebook fans! Also, join us at Twitter! 5. According to a Rasmussen Poll, 80% of Americans plan to stay home during the holidays this year. That’s up from 77% last year and 60% in 2006. Only 14% plan on hitting the road this season. Surprisingly, only 45% blame their lack of travel plans on the economy. 6. Jodi and I have been loving our new Jotul fireplace! There's something about smoke coming out of the chimney that just makes a house look inviting. Although it is a curious thing that someone would intentionally build a fire in their house. Now the biggest problem I have is going around the house finding drafts, and trying to seal them off. 7. Tiger Woods has stepped away from golf indefinitely. While I will miss watching him, I would like to add my two cents to the situation: No amount of fame, fortune or celebrity will ever fill you, or satisfy. I believe that there is an emptiness in all of us, and that void was intentionally designed by God and placed there so that we would seek Him to fill it. But, more often than not, we try to fill it with other crap that doesn't bring lasting happiness or give us life on the inside. I'll still cheer for Tiger when/if he decides to come back, but more importantly, I pray he finds God and that his family is restored, because when the last cheer is cheered for Tiger, he could be alone in an empty house full of trophies and that would be worse than losing any golf tournament. 8. I finished my Fantasy Football regular season 10-3, and had a first round playoff bye yesterday! The last two years my team was awful, so I'm happy to be this far. The studs for me... DeSean Jackson, Tom Brady, Ray Rice, and Thomas Jones. Lots of high scores from them this year. 9. An office desk has 400 times more bacteria than a toilet. 10. Curvy wooden magnetic photo frames! Check them out at Photojojo.com! Don't forget to enter the Christmas tree contest on Facebook!! There's a free Lifestyle session at stake! We are in the middle of our annual Christmas Tree Contest at our Facebook page! All we need is for you to 1) become a Fan of Gehman Photography!, 2) upload one or several images of your Christmas tree... close up, far away, you can be in the photo... whatever you come up with. Anyway, after you upload the photo, 3) browse the other photos, and choose "Like" when you find one you like! The tree photo with the most "likes" gets a free Lifestyle Session from Gehman Photography worth $250!! Aravis is one of those cute little kids that I keep asking questions just to hear her talk! I love how she says her name, and her new little brother's name... it's just adorable. Anyway, Aravis and her baby brother are cousins to our kids and we love when they come over to play! O Christmas Tree! :: A Contest! At the Gehman household, Christmas trees are one of our favorite holiday decorations. We have 3 large trees on display, and 5 small trees in various rooms of our house. I'm not sure why it is this way, but Christmas trees are cool, alright? I'm not sure how many years we've done this contest, but it's always fun to see other people's trees and how they've decorated them. So, we're bringing the Christmas Tree contest back to the blog... except, not. This year, we're moving the contest to Facebook! The contest, the rules, the photos are all on our Gehman Photography Facebook Page, so click the link and get those photos coming! a free Lifestyle Session from Gehman Photography, worth $250! The only rule is that you have to be a fan to enter, and a fan to vote. You can vote for as many trees as you like. The contest ends when I wake up Christmas morning! 1. Jodi and I took our family Christmas/New Years photo last night. Lets just say it was the most creative and time consuming family photo we've ever taken, and it's AWESOME! The title of the image is "Enjoy The Moments" and I'm so sorry I can't put the picture on the blog yet, because... well, duh, that would defeat the purpose. I will post the picture sometime after we mail them out. This year, we're doing magnets. Seems like the cool thing to do. 2. My Dallas Cowboys may have just killed their playoff hopes with 4 games left. I am losing the love for Tony Romo. He just isn't the same guy he was 3 years ago and it's super annoying. I love playing fantasy football, but the Cowboys are killing owners this year with their terrible inconsistency. Oh well, moving on. 3. Anyone else fed up with AT&T? We love our iPhone, but the service is ridiculous. Almost not worth the phone. I wish they would ditch the misleading commercials and use that money to put up some 3G towers... or even some regular towers would be helpful. 4. I'm the assistant JV and Varsity basketball coach at Jackson's school this year, and it's been a blast getting to know the kids and working our way to a 2-0 record so far. Our next game is Thursday, so come on by if you're in the area! 6. In a recent poll, 60% of women surveyed said they bought something on impulse in the past year, spending $108 on average, and 35% regretted it. 7. Take time to rest. Even God rested after he created the world. So what makes us think we can fill every waking moment with something and not burn out? 8. I participated in Black Friday this year for the adrenaline rush only. I stayed up all night and only bought a pair of jeans. 9. 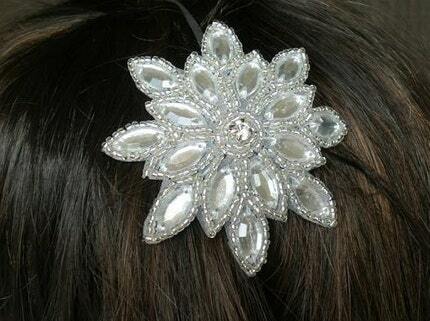 Ladies, here's something classy to wear in your hair to your Christmas Party, from Etsy.com! 10. Did You Know? : The ZIP in “ZIP code” means Zoning Improvement Plan. Jodi took this picture last night as the snow was falling. The 2009 wedding season came to a close for us this past weekend on an unbelievably gorgeous late November Saturday afternoon! After 24 weddings and over 43,000 images, we're finished until 2010! For those of you who are new to Gehman Photography, we only accept 20-25 weddings each year, and again we have reached our goals! This year we were so blessed to meet some wonderful couples, each with their own unique way of expressing their love to each other, and each with their own wedding flavor. We've been through heartache that we hope we never have to deal with again when one of our brides passed away, but have again realized the importance of photography and the joy of two people falling in love. We've said it before, but Jodi and I absolutely LOVE being married, and I think that's why we enjoy photographing weddings so much... It reminds us of ourselves and our relationship, and we love the challenge of capturing that in each couple that comes our way, even though they might show their love differently than we do. We are thrilled about the opportunities we have in 2010, and it'll be sweet to see what all God does with us, and through us. We have several trips planned this winter, including a national photography convention in Nashville, visiting my family in PA, and I'm headed back to Haiti in February... all before the 2010 wedding season kicks off next Spring! Can't wait! There's more to come next week! Have a great weekend, see you on Monday!